The new All Articles section of Times of San Diego. Times of San Diego has added a new section that lists all articles in reverse chronological order for easy reading of breaking news. The site typically publishes more than 20 articles a day, so a story can quickly scroll off the home page. Clicking on the “All” button on the menu will take you to the All Articles section. The site automatically resizes for smartphones and tablets, but the All Articles section may be more convenient to read on an especially small phone. You can easily create a home page link on your smartphone. On an iPhone, tap “Sections” on the Times of San Diego Home Page and choose “All.” Tap the share icon (the box with an arrow) and then “Add to Home Screen.” You can rename the link if you wish. On Android phones, tap “Sections” on the Times of San Diego Home Page and choose “All.” Then tap the three-dot Android menu at the top right and choose “Add to homescreen.” You can rename the link if you wish. 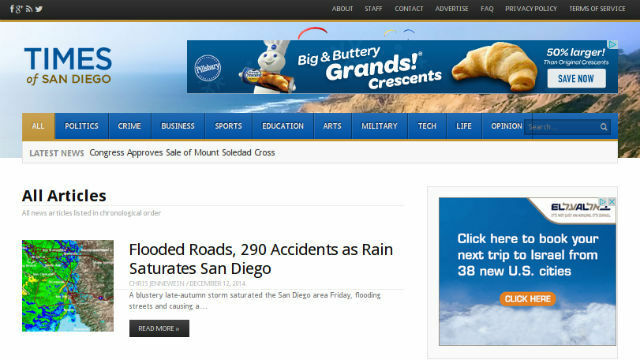 If you have suggestions for improving Times of San Diego, please send to info@timesofsandiego.com.